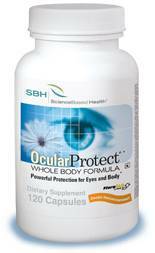 proud to offer these fantastic nutraceuticals to help with overal eye wellness and prevention. Science Based Health was founded in 1997, and is a leading provider of evidence-based nutraceuticals for eye health. These products can be purchased on-line (click here) or directly at our Eugene practice. Click here to make your appointment to learn which product is best for you. OcularProtect is a robust, antioxidant-rich multinutrient that offers advanced protection for visual and whole body health. OcularProtect delivers optimal levels of over 40 key nutrients, including a diverse array of natural plant compounds, that help to fight free radicals and promote overall well-being. 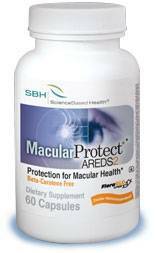 MacularProtect delivers the nutrients at levels found to help preserve eyesight in the AREDS and AREDS2 clinical trials, including 10 mg of lutein and 2 mg of zeaxanthin. It also includes important B vitamins linked to macular health in research. HydroEye is a patented nutritional formulation that works from the inside out to provide continuous support for dry eyes. HydroEye, the focus of new research, delivers a proprietary blend of omega fatty acids (GLA, EPA and DHA), antioxidants and other key nutrients that work together to support a healthy tear film and soothe the ocular surface.